NETWORK FINALS: As expected, there were football-related drops of 0.3 for the SVU rerun, 0.2 for the SWAT and GOOD PLACE reruns and 0.1 for BIG BROTHER and the BIG BANG THEORY rerun. CABLE HIGHLIGHTS: NFL Network’s solo THURSDAY NIGHT FOOTBALL was at 3.04, up 0.45 from last week’s game. On MTV, JERSEY SHORE dropped 0.15 to 0.76. On ID, TO CATCH A KILLER jumped 0.12 to 0.34, and THE PERFECT MURDER was up 0.07 to 0.26. The season finale of FX’s SNOWFALL slipped 0.02 to 0.34, down a slim 0.05 from the 2017 finale. On History, MOUNTAIN MEN rose 0.04 to 0.33. Fox News’s THE INGRAHAM ANGLE led cable news at 0.33/0.55/3.4M, with MSNBC’s RACHEL MADDOW SHOW at 0.30/0.46/3M, and CNN’s CUOMO PRIME TIME at 0.19/0.26/1.1M. On HGTV, HOUSE HUNTERS dropped 0.05 to 0.31, HOUSE HUNTERS INTL lost 0.03 to 0.27, and FLIP OR FLOP was down 0.03 to 0.26. 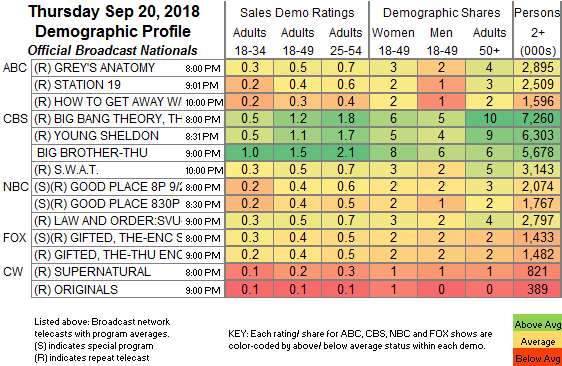 Tru’s IMPRACTICAL JOKERS fell 0.08 to 0.29. Bravo’s SHAHS OF SUNSET ticked down to 0.29. Nickelodeon’s 6PM LOUD HOUSE was at 0.26. Food Network’s CHOPPED was at 0.26, BEAT BOBBY FLAY was up 0.05 to 0.24, and BITE CLUB was up 0.03 to 0.22. 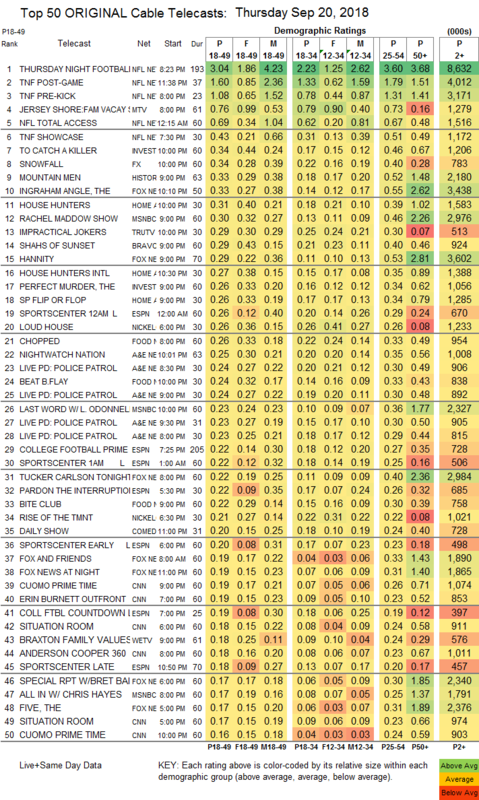 A&E’s LIVE PD was at 0.24/0.24/0.23/0.23 compared to last week’s 0.35/0.31, and NIGHTWATCH NATION was down 0.04 to 0.25. We’s BRAXTON FAMILY VALUES was steady at 0.18, and BOSSIP ticked down to 0.11. BET’s THE GRAND HUSTLE ticked down to 0.15. CMT’s DALLAS COWBOY CHEERLEADERS held at 0.10. POP’s IMPACT WRESTLING dropped 0.02 to 0.05.